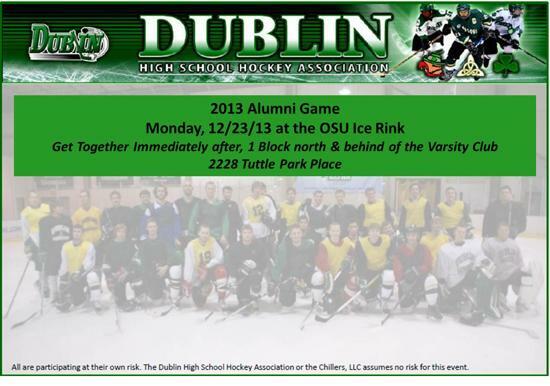 On Friday, December 26th, the Dublin High School Hockey Association hosted its annual Alumni Game at the Dublin Chiller. This year we had 20 players join us for the event which included 4 goalies. We were joined by a number of the parents in the "stands". After a few minutes of warm up, the boys went on to play 90 minutes of hockey. If anyone was counting, the final score was 30 - 24. In the end, the boys got a great workout and the parents and friends got a chance to catch up. Afterwards, most of the guys joined us, along with a number of the parents, at Shade on Muirfield for food and camaraderie. We want to thank all of the guys that came out to play the sport they love. For the parents we got a chance to, once again, see the boys in action. Again, many thanks to all. It was great to see everyone out there. Mark your calendar as we'll plan to see everyone on Saturday, December 26, 2015. Let's make next year even bigger. If anyone has information on any alumni who have played or are currently playing hockey for a college varsity, college club or junior team, please forward the information to The Alumni Committee. 2012 Alumni Game will be on December 26, pizza and soda at The Bogey Inn afterwards. Contact Paul Hunt. 2011 Alumni Game will be on December 26 from 4:40 to 6:40pm. Thanks to EJ for coordinating this! 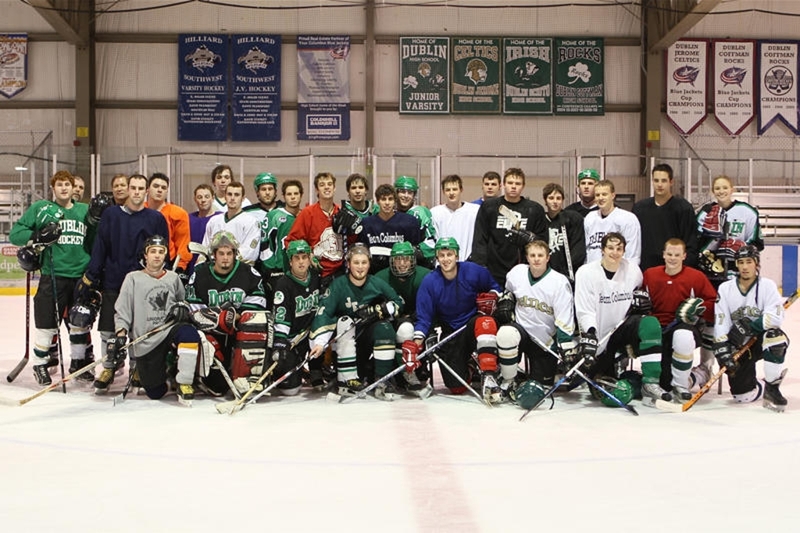 There was a good turnout for the 2009 DHSHA Alumni Game. Thanks to Nancy Nagel for organizing this fun event. Good to see you back, alums!